Maximum Driftcast News News What's up with D1 Street Legal name change to D1 Lights? Yesterday we all saw an unexpected name change on D1 Grand Prix’s “Street Legal” series also known as D1SL or D1 Street Legal. Suddenly it was called D1 Lights and with the name change a lot of speculation and controversy started all over social media. Both come with chassis regulation change. Starts with a lot of revisions in the former Street Legal regulation. Knuckle modification will be limited. Shortening the tie rod connection part is allowed but except for that, you can’t do much for knuckle. Especially, with the concern of wheels coming off chassis like the former accident at Nikko, any process on the parts of knuckle facing hub and coil overs is prohibited. Adding to this, roll-center adjusting adapter (installed between lower arm and knuckle) is also.prohibited. Because this performance part is considered to cause the tragic accident at Nikko. Not only additions of restrictions to this new regulation but also some of the regulation show moderations like relocation of fuel tank(FIA, JAF, SFI spec over 28.2l), dry carbon roof and sequential transmutation after 2019. Starts with less regulation revisions compared to D1 Lights. So chassis compliant to Driftmuscle regulation can compete with this new regulation without big chassis spec change. 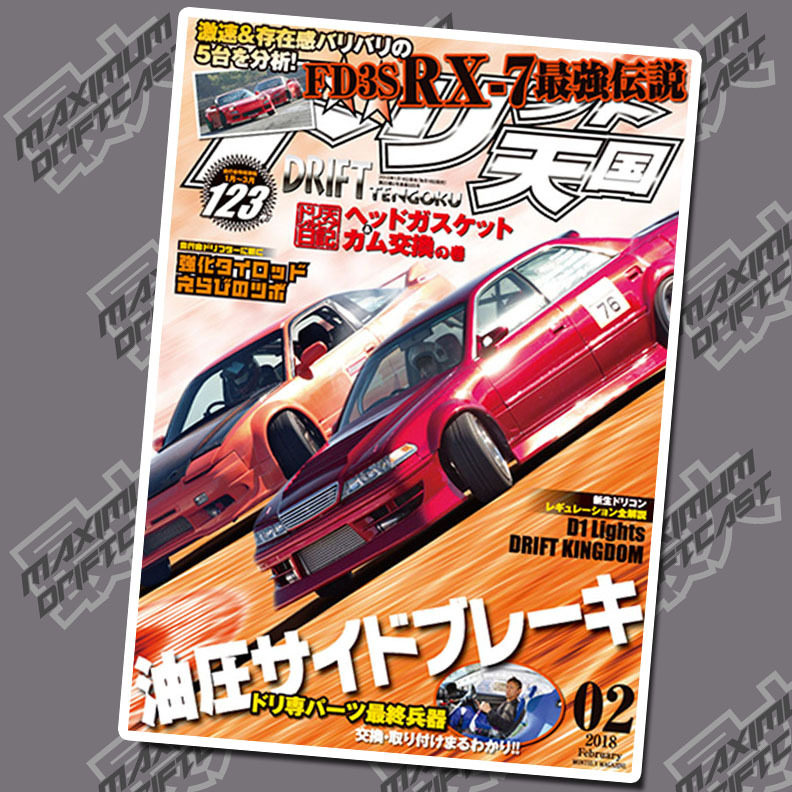 It has two classes like the former Driftmuscle. Clubman class is equivalent to the former Muscle class. Professional class is equivalent to the former Super Muscle class. But suspension setup is subject to strict regulation in the same way as D1 Lights. DIY modification like extending lower arms and short knuckle can’t be allowed. These modification must be done by makers or shops and come with strength test sheets. For the safety purpose, tire air pressure will be checked on winning chassis 30 minutes after competition in separated circumstances. If the air pressure is below 1.2kg the prize will comes to forfeit. It’s like Parc Ferme rule. This is meant to avoid tire bead from coming off wheel. Use of HANS devise is highly recommended in the new regulation for driver’s safety. This is a rough translation by Takeshi Ode from the main paragraphs in the magazine. We will keep you guys updated as we learn more. Bryan is the control room operator for the crew. Also known as Big Balls Bryan, Triple B and 8-Bit Bryan. He is an avid retro video gamer, synthwave music fan and a big time car movie buff. He has lots of experience in sim drifting but he used to drift a 350z in real life. He is also known for the 8-Bit Miata and he is currently building an E46 1JZ BMW for ProAm. He just became the owner of Paco\’s LS400 after \”remodeling\” the car against a wall.